In excellent news for Westfield shares, a new study has found that Aussies are flocking back to bricks and mortar stores in huge numbers. In fact, we made 90 million for visits in the 2015-16 financial year than we did the year previous. However, the study by Roy Morgan Research wasn’t all rosy for retailers. It showed that bricks and mortar stores are only now starting to claw back the visitation levels that online shopping decimated over the past five years. In fact, the numbers are still well down on five years ago (by some 100 million trips, despite Australia’s growing population), it has shown signs of a turnaround more recently. In the financial year to June we made a combined 1.43 billion trips to department stores and discount stores, hardware stores and homeware stores, clothing stores, music stores and newsagents. The graph below shows our visits to particular categories and it showed visit to music stores as static and the numbers actually fell for newsagents. Over recent years, shopping centres have invested heavily in “retailtainment” where customers go to be entertained (cinemas, eateries) as much as they do to shop. And that could also be a reason for the increase in foot traffic. But all this doesn’t mean we’ve lost our appetite for online shopping either. The Roy Morgan study found in an average four weeks, 43 per cent of the population make at least one purchase via the internet, spending $3.2 billion between them — equating to $41.3 billion last financial year. This represents an increase of 9.75 per cent on the amount spent during the 2014/2015 financial year. 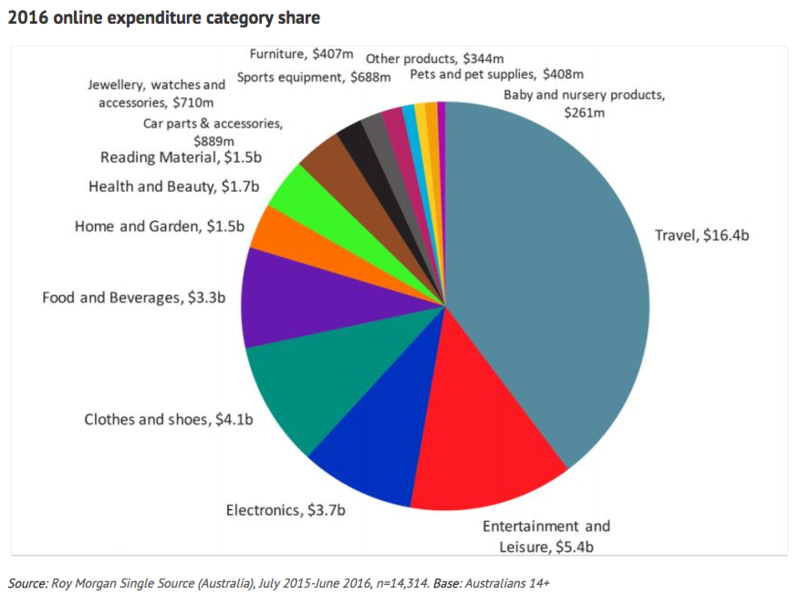 Retail products account for almost $20 billion of Aussies’ total online spend. The rest goes on travel ($16.4 billion) and entertainment and leisure ($5.4 billion). According to Roy Morgan, the fastest growing online category is is baby and nursery products. Due primarily to a surge in eBay, purchases in this category are up almost 50 per cent in just 12 months. Admittedly, this growth is from a small base— from $180 million per year to $260 million. Commenting on the study, Roy Morgan CEO, Michele Levine, said: “In 2008, when Roy Morgan first focused on retail in a State of the Nation report, we asked our audience and readers to ‘imagine a world with no shops’. Back then, the burgeoning digital age and rise of online shopping appeared to pose a serious threat to traditional bricks-and-mortar stores. “These days, bricks-and-mortar stores are anything but traditional. To survive in these changing times, retailers have had to develop a more omni-channel approach, so customers can choose how they shop with them: online, offline or a mixture of both. “And they’ve been successful: just over a third of Australians’ internet spending goes to the online channel of ‘traditional’ retailers (as opposed to online-only stores). Considering that traditional retailers’ share of the online market was close to zero in 2010, this shows the progress they’ve made. 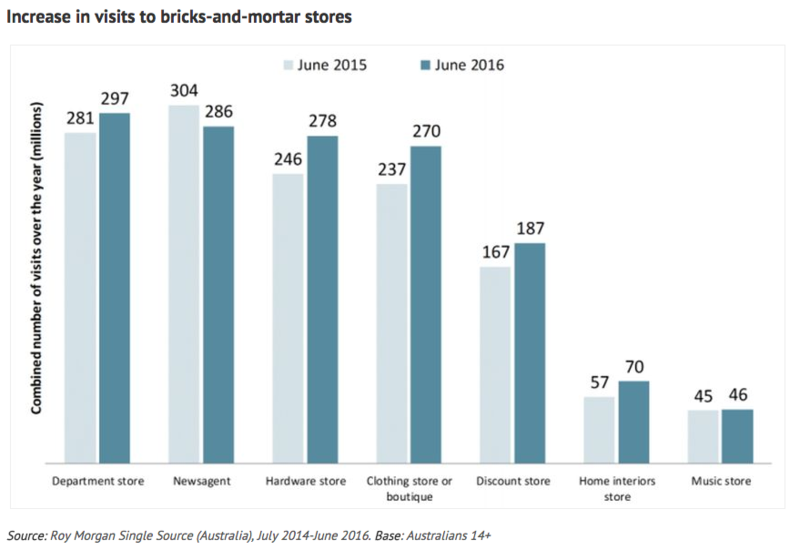 “However, given that Aussies are spending more on experiences and less on discretionary commodities than they were just 12 months ago, bricks-and-mortar retailers now face the challenge of turning this enhanced shopping experience into actual purchases. Especially with further competition anticipated by several more overseas retailers with Australia set firmly in their sights,” she said.